I'm not entirely sure when I first visited the Islay Woollen Mill, it could have been during my first visit to Islay in 1998, it could have been 1999, but I certainly visited it in 2000. 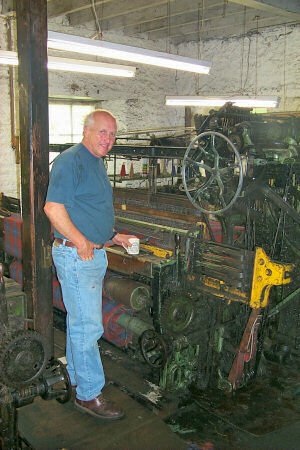 The picture of Gordon Covell at one of the looms in the mill is from 2000, when he showed me around the mill. The mill has been around for a very long time, located on the River Sorn near Bridgend. I don't think it uses the river any longer to power the looms, but is still in the same location. In 1995 Gordon was asked to design and produce cloth for the film Braveheart. A four-figure cheque arrived from Shepperton Studios to "concentrate his attention on the task." He spoke on a number of occasions to Mel Gibson, who not only directed the Academy-award-winning film but also starred as William Wallace, the ardent Scottish nationalist who fought to shake off England's thrall. I'm the proud owner of a Finlaggan Tartan rug (as is my sister who received it as a birthday present from my mother), very nice and fantastic quality. When visiting Islay the Islay Woollen Mill is certainly worth a visit, make sure you have your credit card ready.